At Los Altos Academy of Engineering, the students are separated into different teams and work together to bring their projects to life. SCE engineer Diego Hinojosa talks about some of the cool projects he's worked on since graduating from Los Altos. Senior Eric Martinez and his classmates designed and built this six-wheeled, motor-powered robot for a competition. As part of the program's IT team, sophomores Vicky Zhai (left) and Amy Tam work on a computer program in class. At Los Altos Academy of Engineering, students are involved with projects such as designing and building battery-powered cars. Diego Hinojosa visits his old high school to encourage students to pursue careers in engineering. 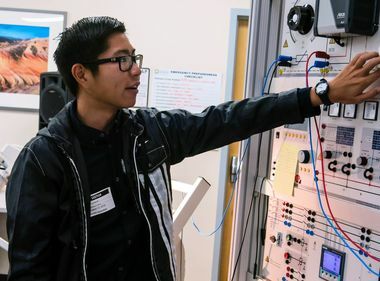 As Diego Hinojosa, 28, walked through the classroom at Los Altos Academy of Engineering, it was exactly as he had remembered — from the desk arrangements to the science posters and college banners adorning the walls. As the bell rang, the teenagers piled into the room. The last time Hinojosa was here, he was a student. Now, the Southern California Edison engineer stood at the front of his former engineering technology class to share his experiences with the next generation. The engineering classroom looks like any other with computer desks and whiteboards, but upstairs it is filled with mill equipment and heavy machinery for welding. Students proudly display their battery-powered cars and robotics projects. This is where Hinojosa spent hours building solar cars and designing robots for races and competitions. Students at Los Altos' engineering class learn how to use heavy machinery. Hinojosa joined SCE as a technician testing electric vehicles and battery technologies after graduating from Los Altos. 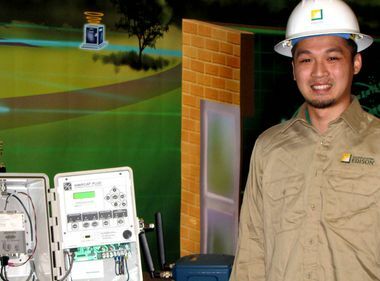 After earning his mechanical engineering degree from Cal Poly Pomona, he became a project manager at SCE’s Advanced Technology Labs. 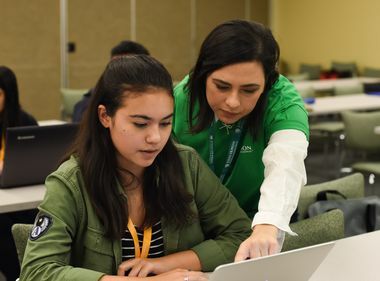 Students are divided into teams and tasked with bringing their projects to life, which involves working out the mechanical details, as well as leading fundraisers, applying for grants and publicizing their ideas. Hinojosa and two of his fellow SCE engineers, Julian Ang and Michael Harrington, hope that by visiting Los Altos and sharing their own experiences, they’re able to make engineering professions seem more accessible. The trio also wanted to highlight the innovative projects they’ve been involved with, working on the forefront of technology to increase the reliability of the electrical grid.